The USDA Is Gonna Do What? The outbreak of several Asian-origin Highly Pathogenic Avian Influenza A (HPAI) viruses is still wreaking havoc for industrial egg and turkey integrators. And the USDA has a vaccination program that’s supposed to address HPAI—but it’s naïve at best or ludicrous at worst. It’s difficult to keep up with advancement of the HPAI viruses‑H5N2, H5N8, and H5N1—and difficult to keep up with the related data collected by the USDA’s Animal Plant and Health Inspection Service (APHIS). As of mid-to-late July, 223 separate reported incidents had affected more than 49 million birds. Fewer than 9,000 of the birds have been grown in small, so-called “backyard” operations. The remainder are from commercial, industrial operations. Recently, some broiler operations (chickens raised as meat) have experienced outbreaks as well. The current concern of the industry and United State Department of Agriculture (USDA) officials is what will happen this autumn when wild waterfowl such as ducks and geese migrate south for the winter. The fowl use four main flyways that cross the United States north to south: the Pacific flyway, the Central flyway, the Mississippi flyway, and the Atlantic, or Eastern, flyway. This spring, when the waterfowl used these flyways to migrate from the South toward the Arctic Circle, APHIS logged the major HPAI outbreaks: there were 41 million birds affected in the Mississippi flyway and about 5 million in the Central. Birds using the Atlantic flyway were unaffected. But having spent all summer in the “Arctic mixing bowl,” there is justified concern that birds traveling in the Atlantic flyway this fall will carry HPAI. A great number of industrial broiler and layer operations are located in the Atlantic flyway—which means that these operations could be jeopardized by infected waterfowl flying in the Atlantic flyway. These concerns have gotten the attention of members of the House Agriculture Committee. An oversight hearing was held on July 30 by the Committee to hear about USDA’s plans for this fall to prepare for a possible resurgence. Among the star witnesses were Dr. John Clifford, USDA’s Deputy Administrator of Veterinary Services, and Dr. David Swayne, the Laboratory Director and Supervisory Veterinary Medical Officer at the Southeast Poultry Research Laboratory (SEPRL), part of USDA’s Agricultural Research Service’s U.S. National Poultry Research Center in Georgia (which may be the longest title in the federal government). During questions by the House Committee members, Dr. Swayne said that the effectiveness of the vaccine rested partially on how it is administered. To be the most effective, broilers, layers, and turkeys would have to be injected twice, three weeks apart. Breeding hens, the birds that lay the eggs incubated to mature into the broilers raised for meat, would have to be vaccinated three times since they live longer. It has been reported that USDA will stockpile 500 million doses of vaccine. But here’s the thing. The United States produces 8.6 billion broilers a year, which would require 17.2 billion doses maximum (with the acknowledgment that there are not 8.6 billion broilers at the same time in the country.) If you do a rough estimate, that annual production level could be a monthly rate of 716 million broilers requiring 1.43 billion doses of vaccine. According to USDA, there were 270 million laying hens in June 2015, which would require 500 million doses. There are 244 million turkeys raised annually which would require 488 million doses, or approximately 20 million birds a month which would require 40 million doses. 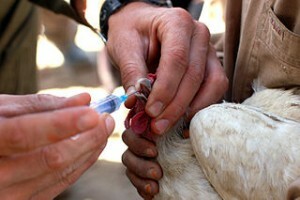 How in the world can a vaccination program work with the large numbers of birds that need to be covered? I have seen eggs injected with small amounts of antibiotics by the thousands before being incubated. So, the first injection of HPAI vaccine could be relatively easy. But three weeks later, with the broilers and turkeys in growing houses and free to move about, I can’t imagine how you could vaccinate them the required second time. It’s not like the birds will line up for the second injection. Admittedly, it will be easier to give the second vaccination to layers since their movement is inhumanely restricted in battery cages. But to think this will be a simple, or easy, process is wishful thinking. At an HPAI conference in Des Moines, Iowa, Agriculture Secretary Tom Vilsack said that USDA will spend $700 million and has hired 3,000 additional employees to carry out a vaccination plan. USDA has already spent over $500 million to control the outbreak and on disposal of the dead birds but nothing spent to change the system to lessen the possibility and inhibit the spread of novel flu viruses. While it is important to contain this HPAI outbreak, we must address the structure of industrial food animal production in order to minimize the repeated outbreaks that are intensifying with each occurrence. This is especially important when public funds are allocated to contain outbreaks and mitigate harm. Lower animal density in all industrial animal production operations is absolutely necessary to slow the evolution and spread of highly pathogenic viruses. The good news is that USDA has helped contain this outbreak. And it is also good news that Secretary Vilsack has committed $191 million to reimburse contract broiler producers for lost birds since they live contract to contract and would not be covered by the livestock indemnity program since they do not own the birds. But propping up a system that endangers public health, damages the environment, threatens rural communities while being inhumane does not make sense. Vaccine Issue Raised at US House Avian Flu Committee, The Poultry Site, www.thepoultrysite.com, August 3, 2015.